This week, Guillermo del Toro announced that the long-mooted Hellboy 3 was officially dead, which seems unfair considering properties as tedious as Captain America get a whole trilogy. Yeah I went there, what’s he going to do, bore me to death? Big Red (Ron Perlman) is back in this superior sequel from 2008, this time going up against the Golden Army, controlled by a magical crown split into three pieces; one piece belonging to humans and the others to elves. It sounds a bit like that rather famous fantasy trilogy, and indeed looks like an audition tape for The Hobbit movies that del Toro sadly never made. He plunges us even deeper into the fantastic world he built in 2004’s Hellboy, fleshing it out with wonderful, diverse creatures and awesome, steampunk designs. The great Mexican horror director made his first foray into comic book movies in Blade II, and left an impression like Red’s giant stone fist. 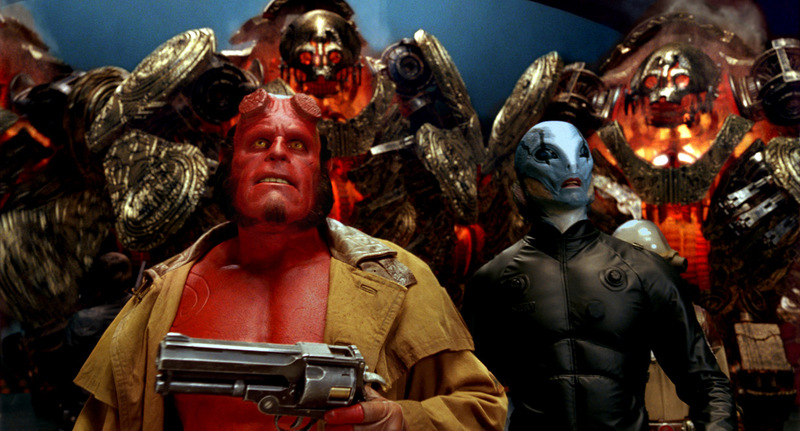 Then with Hellboy, he made a superhero film with a sense of individuality that’s rare in the genre. Before the sequel, he created modern classic Pan’s Labyrinth, and returned to Hollywood with an even more refined aesthetic. His love of this material is evident in every scene, where there’s always something interesting happening in the background, always marked by the magical strangeness he does so well. The foreground is filled by Perlman’s forceful yet likeable presence, alongside Jeffrey Tambor, John Hurt and Doug Jones as amphibious sidekick Abe Sapien (David Hyde Pierce did the voice in the first film but refused a credit because he felt it belonged to Jones, who gets to use his own voice here). The only weak link is Selma Blair’s love interest, who feels dull next to these larger-than-life characters, including a German man made of gas (John Alexander, James Dodd and Seth MacFarlane) and the former drummer from Bros (Luke Goss). From its Danny Elfman score to its climactic fight on rotating, golden gears, Hellboy II is action-packed and eccentrically funny; memorable lines include “She’s going to eat the cat!” and “I’m not a baby, I’m a tumour.” You’ll be won over by its characters and blown away by its audacity, as del Toro seemingly draws inspiration from sources as varied as Jim Henson, Paul Verhoeven and H. P. Lovecraft. Fun and irreverent, imaginative and weird, this makes Thor look (even more) like Hercules in New York. It’s this individuality that at once warrants and disqualifies further Hellboy movies, within a system that’s so averse to projects that are genuinely creative and bold, as opposed to the superficial novelty value of Deadpool. Did I say that out loud? Boy, is my face red.